It takes planning to go from working in your business to working on it. I love what I do and don’t want to kill myself doing it. I want to have a life and enjoy it, and believe there can be a balance between work and play. In fact, work should be fun. Work isn’t fun for most entrepreneurs due to the nagging issues that arise from running a business. Business owners might have a passion for the industry they’ve chosen, but it’s their business’ operations that demand attention, consume more time, and are typically considered least enjoyable. Most entrepreneurs are made, not born. 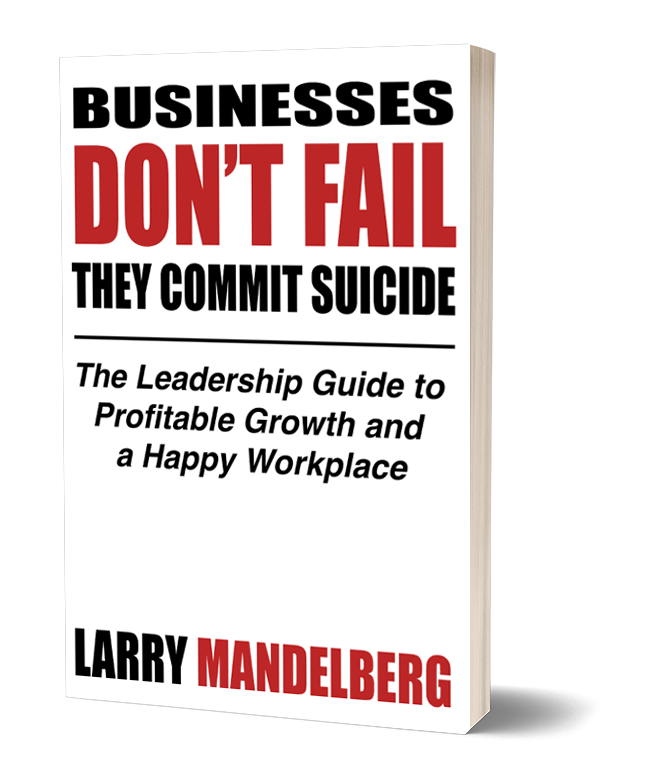 You arrive from the ranks of corporate America physically and emotionally consumed by bad managers, unfocused leadership and stock market pressures. You have skills, knowledge and a burning desire to start your own business. After a few years of sweat and tears, you have customers, sales and a paycheck. You’re free, your own boss with your own business. Then one day you look around and realize you are trapped again, in a different way this time. The answer is found in the difference between a professional organization and an entrepreneurial one, and it has nothing to do with revenue or number of employees. It has to do with the way you approach your job as leader. Assuming your organization has all the necessary technical skills and knowledge needed to serve your customers, there are three areas where big business can provide valuable guidance. The best thing you can do for your business is plan. Thorough, well-thought-out, collaborative plans created by the best minds available. Timely plans that recognize current environmental circumstances. Plans where assumptions are not allowed to masquerade as facts, but are recognized and have contingencies designed to kick in if assumptions are wrong. This type of thoughtful, deliberate planning requires you and your thought leaders to gather, review past performance, and revise plans for the future. These sessions take time and expertise. You’ll never find a big business trying to run such a session without a professional facilitator. Big business doesn’t rush the planning process. They weren’t successful by trying to extract ideas and applying them in a few hours. Strategic planning takes time — often more than businesses are prepared to give. It also requires a business plan for a foundation, a clear definition of roles and responsibilities, and systems and structure that staff understands. A business that does not understand its purpose has created an environment of uncertainty for staff as well as customers. It’s not about what you offer, but the value your offerings deliver. The value of Microsoft Corp’s products and services is productivity. Even so, Microsoft is not a software manufacturing company — it is a sales firm that sells licenses. Internally, staff knows their purpose is to sell licenses. Externally, it paints an image of a more efficient and productive world through its software. Just as the purpose of the business must be clear, so must be the roles for accomplishing it. Staff must be hired to fill specific roles. Roles should not be created to fit existing staff. People work for one of two reasons: Either they love what they are doing or they are paid well for doing it. Those motivated by the love of what they do are dedicated to a purpose which leads to consistency and sustainability. A common cause creates alignment where the organization can function as a team. People whose primary motivation is financial are part of the team as long as they are compensated adequately. When that changes, they switch teams. Big business is always looking for new ways to deliver value to untapped markets and add value to existing ones. This occurs in two ways: first through training of existing staff, and second, by adding new products and services, both of which requires being on the lookout for synergy with other firms either through a partnership or acquisition. Merging or acquiring another business does not need to be expensive or difficult. It does involve risk and requires planning and careful execution. However, the benefits are huge. The cost of expanding geographically and physically can be enormous, and returns on those investments can take years to realize. When merging or acquiring another firm, you have the opportunity to realize immediate access to new markets, resources and revenue. In the world of business, moving your organization from an entrepreneurial firm toward a more controllable, predictable, professional organization can be a challenge. Whether you are a large corporation like Microsoft or a small micro-business with one employee and $200,000 in revenue, there is an opportunity to incorporate each of the ideas stated above. Take your time and think about what you want out of your business. What is your exit strategy? How long do you want to keep working? What is the ultimate goal for you and your firm? When you begin to find answers to these questions, you will be well on your way to managing your business from a strategic perspective instead of a tactical one. Interesting post. will be sure to come back to this blog again. Thanks. I’ve been inactive for sometime because a) I’m really busy and b) I’ve been told that blogs are passe and that I should be using LinkedIn. What are your thoughts? What would you like to hear more about? Are you a fan/user of LinkedIn? Would you prefer this medium or LinkedIn?